Palli Karma Sahayak Foundation (PKSF) organized a seminar on the occasion of observing International Women’s Day at PKSF auditorium on 29th March, 2016. 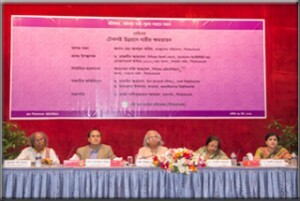 The seminar took the title of ‘Women Empowerment in Sustainable Development’. Dr. Qazi Kholiquzzaman Ahmad, Chairman, PKSF chaired the seminar. A number of 249 women representatives from 150 Partner Organizations participated in the seminar. 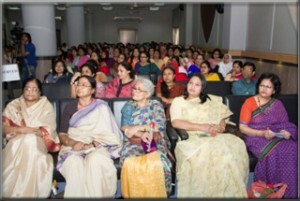 Moreover, PKSF’s high officials including all of its women employees took part in the seminar. At the beginning, Mr. Md. Abdul Karim, Managing Director, PKSF gave his welcome address. Honorable Chairman of PKSF, Dr. Ahmad highlighted a recent issue on violence against women by citing the atrocious killing of Sohagi Jahan Tonu, a student of Comilla Victoria College. In protest, all the participants present at the seminar raised their strong voices against such brutality and demanded immediate justice against this savagery act. Dr. Nazneen Ahmed, Senior Research Fellow, Bangladesh Institute of Development Studies (BIDS) and one of the Members of the General Body of PKSF, presented a keynote paper in the seminar. In her article, she focused on the gender discrimination in the context of Bangladesh and noted the importance of empowering women in achieving sustainable development goals. Prof. Shafi Ahmed, Senior Editorial Adviser and Member, General Body, PKSF, was the discussant of the keynote paper. Dr. Nasreen Ahmad, Pro Vice-Chancellor, University of Dhaka, was also present as a Special Guest of the seminar. Dr. Nasreen cited multidimensional role of women for achieving sustainable development. The Honorable Chair Dr. Kholiquzzaman Ahmad made closing remarks. After the end of the seminar a delighted cultural show was performed by Heed Bangladesh, a Partner Organization of PKSF with a different type of picture displayed songs titled ‘Patgunn’ on ENRICH programme of PKSF.